Before it could rise into the sky, Manhattan had to first create the streets, avenues and blocks that would later support the 20th century skyscrapers. In the early 19th century, New York's population was continuing to increase having tripled to 96,373 since 1790 mostly due to the growing port. It was then predicted that 400,000 people would live in the city by 1860. The City planners were entrusted with planning the city in 1811. They proposed a grid for the future city stretching northward from roughly Houston Street to 155th Street in the faraway heights of Harlem as the layout in the photo (above) and map (below) show. The grid plan is a type of city plan in which streets run at right angles to each other to form a grid. The Greeks and Romans used City Grids as did the Chinese from 1500 BC onwards. The Chinese Tang 唐 Dynasty laid out their capital city in a grid plan. The Roman model was also used in Spanish settlements during the exploration of the Americas. In 1573, Felipe II compiled the Laws of the Indies to guide the construction and administration of cities in the Americas. The Laws specified a square or rectangular central plaza with eight principal streets running from the plaza's corners. The grid plan became popular with the start of the Renaissance in Northern Europe. 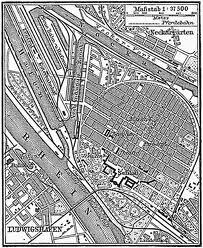 In 1606, the newly founded city of Mannheim in Germany was the first Renaissance city laid out in the grid plan as the map below shows. An inherent advantage of the geometry of a proper grid is its tendency to provide regular building space in well-spaced sequences. This maximises the use of the land of a block without affecting street frequency - any frequency of streets produces the same packing effect. Furthermore geometry also minimises disputes over lot boundaries and maximises the number of lots that can front a given street. Another important aspect of street grids is that traffic flows of either pedestrians, cars, or both, only cross at right angles. This is an important safety feature, since no one entering the intersection needs to look over their shoulder to see oncoming traffic. Hence the grid is a geometric response to our human physiology. It is highly likely that the original purpose of grid layouts comes from the Athenian Agora where the laying out of market stalls into regularised rows at right angles solved the problem of frequent wagon collisions that occurred when the markets were laid out randomly in a field with traffic approaches at odd angles. 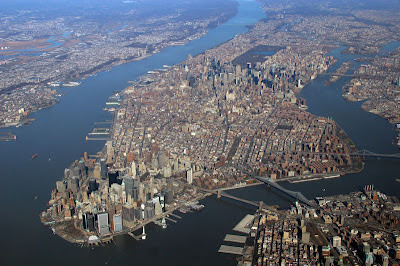 The Manhattan grid plan was a far-reaching, visionary and daring plan to urbanize the geographical limits of the Island of Manhattan.The plan called for a regular grid of streets and property lines without regard to the topography of the island itself. This included numbered avenues running north and south roughly parallel to the shore of the Hudson River. The avenues would begin with First Avenue on the east side and run through Twelfth Avenue in the west. There would also be 155 orthogonal cross streets. Interestingly, Manhattan’s grid is not perfectly regular. No two blocks are ever precisely the same because the grid indulges variety, building to building, street to street. Some avenues are wider. Broadway cuts diagonally across the north-south streets, and those cuts have made room for public spaces (Union Square, Madison Square, Herald Square, Times Square, Columbus Circle, Verdi Square). New York’s grid has proved flexible enough to adapt when the city’s orientation has shifted north-south, and flexible enough to accommodate the creation of Central Park which interestingly was not a part of the original grid plan. It was not until 1853 that the idea for a large area of green space for leisure activities was envisioned. 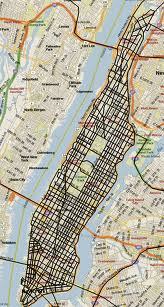 One of the advantages of the Manhattan city grid is that it makes a complex place instantly navigable. Manhattan invites long walks, because walkers can judge distances easily and always know where they are. In contrast other cities such as London which are formed from historic agglomerations of villages, often include vast stretches of nowhere land as they sprawl in ways that discourage easy comprehension and walking. 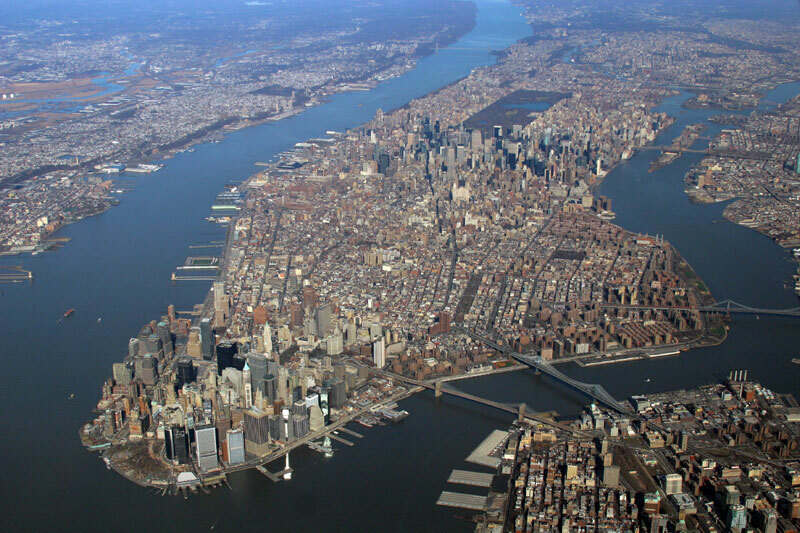 Finally, perhaps one of the greatest benefits of the Manhattan grid is that it gives order through physical form to a city filled with a diversity of ideas, concepts and people from so many different places. It is not likely that this is exactly what the original city planners had in mind back when they proposed that the Manhattan Grid should "promote the health of the City" back in 1811.